9 X 12” casein on Raymar Featherlite Panel. Exhibit at the 89th Annual Juried Art Show at Phillips Mill, PA.
9” X 12” casein on Raymar Featherlite Panel. "The Sky Runs Deep" The Delaware River from the New Hope Lambertville Bridge. 16" X 20" oil on gessobord Exhibited at the 2018 New Hope Art League Juried Show, Juror James Toogood, and at the 23rd Annual Open Juried Exhibition at the Dr. David FLinker Gallery,Virtua Memorial Hospital, MT. Holly, NJ, Juror James Toogood. 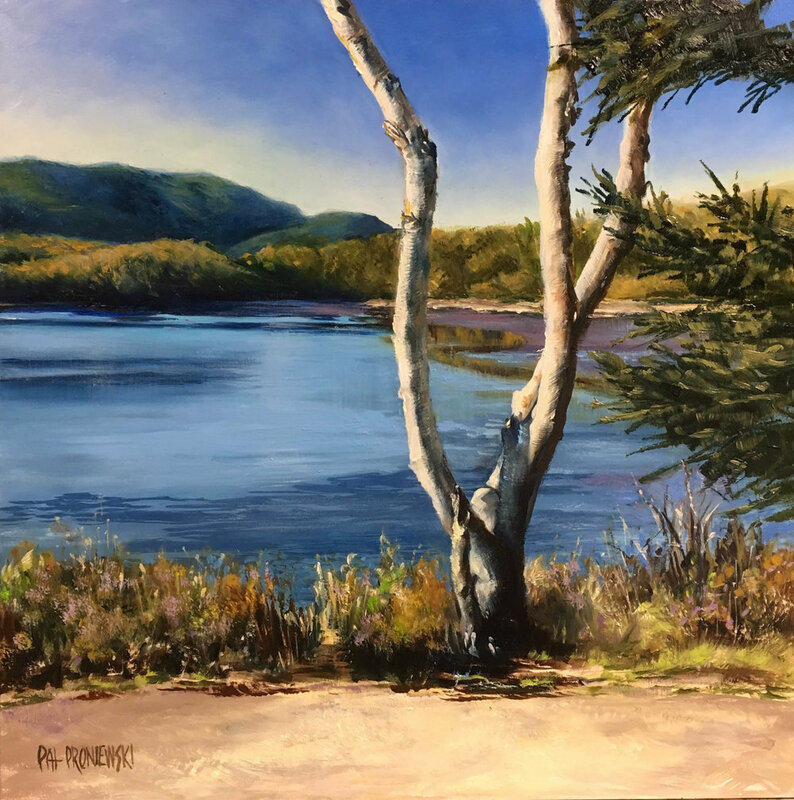 The Lambertville Historical Society Fundraising Auction "Plein Air Plus," 2018, at Rago Arts and Antiques. 2nd Place Award in the Professsional Division at the Mercer County Senior Arts Exhibition 2018. 2nd Place Award by Juror Lorraine Glassner at the Artists of Yardley 7th Annual Juried Exhibit, Yardley, PA.
3rd Place Award by the Juror James Toogood at the Willingboro Art Alliance 23rd Annual Open Juried Exhibition at the Dr. David Flinker Gallery Virtua Memorial Hospital, MT. Holly, NJ. Honorable Mention and currently on exhibit at the 2018 Burlington County 42nd Annual Juried Exhibit, Smithville Mansion Annex Gallery, Eastampton, NJ. "Hot Time Summer In The City"
Third Prize 2018 WAA Open Exhibit at the Smithville Mansion Annex Gallery, Eastampton, NJ. Garden State Watercolor Society Members Show, Middletown Arts Center, NJ, May 2018. New Hope Art League Fall Members Show at The Conservatory, Doylestown, PA, November, 2017.
" Overcast: Yet the Spirea"
"HONORABLE MENTION: The Burlington County 41st Annual Juried Exhibit," Smithville Mansion Annex Gallery, Eastampton, NJ. FIrst Place Award, “The Willingboro Art Alliance Landscape Show” Westampton, NJ. "Budding Blossoms, Kingsland Park, Nutley, NJ"
The Burlington County 41st Annual Juried Exhibit, Smithville Mansion Annex Gallery, Eastampton, NJ. Available at The Touchstone Gallery, Yardley, PA.
Garden State Watercolor Society Members Show, Middletown Arts Center, NJ, May 2018. WAA Annual Juried Art Exhibit, Virtual Hospital, Mt. Holly, NJ.Willingboro Art Alliance 22nd Annual Open Juried Exhibition, Mt. Holly, NJ. Third Place Prize 2016 Smithville Art Alliance Open Show, Eastampton, New Jersey. "Georgic: South River Road Lambertville"
The Carmen Altopiedi Memorial Award for Traditional Fine Arts for "Georgic: South River Road, Lambertville," at the Willingboro Art Alliance 22nd Annual Open Juried Exhibition, Mt. Holly, NJ. October 14, 2017. "Loux Covered Bridge Over Cabin Run"
Currently being held for exhibition. Of A Botanical Nature National Juried Exhibit 2016, Mill Pond House Gallery, St. James, NY. Exhibited at the 89the Annual Juried Art Show at Phillips Mill, PA.
11”x 14” oil on linen mounted on board. Gallery on Division Invitation Exhibit 2017, Somerville, NJ. "The Bank of the Susquehanna River"
The 88th Annual Juried Exhibit at Phillips Mill, accepted portfolio piece. "Fishermen's Cove: Dog Beach, Manasquan, NJ"
"American Beauty" Or "Of Thee I SIng"
SECOND PLACE AWARD "Mercer County Senior Art Exhibit" (Oil Painting, Professional Division) Meadow Lakes, Hightstown, NJ 2017. "The 34th Ellarslie Open Juried Exhibit" The City of Trenton Museum at Ellarslie, Trenton, NJ 2017. The Burlington County 41st Annual Juried Exhibit, Smithville Mansion Annex Gallery, Eastampton, NJ. Sold at the opening reception Sept. 14, 2017 at: Gallery on Division, Division St., Somerville, NJ. "Final Thaw, Sunny Lane Farm"
"Mile High Farm, Watkins Glen, NY"
"Light and Shadow at Dusk"
FIRST PLACE AWARD "The Four Elements: Earth, Water, Air and Fire" The Arts & Cultural Commission of Bucks County Members Show May 2017. Patricia Hutton, Judge. "On the Towpath, Stockton, NJ"
"From Bridge to Bridge: Lambertville-New Hope"
The Lambertville Historical Society Fundraising Auction "Plein Air Plus," 2018, Rago Arts and Antiques Center, Lambertville, NJ.